Luckily, I thought to harvest those Milkweed seeds a little while back. You see, I have a lot of pots strung along the side of the backyard near the swimming pool. They're all on a handy drip feed irrigation system that runs 10 minutes a day and delivers gallon per sprinkler head per hour. Not a lot of waste. I have a lot of plants there. All those Milkweed plants that I thought myself lucky to get the seeds from, and I still have a lot of around the house. Two pots each of Mangos and Bananas. 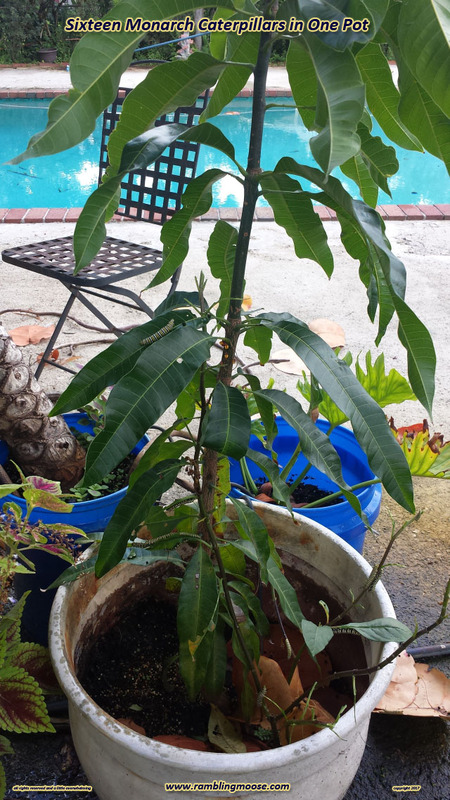 My "cuttings" pot that I am propagating a lot of strange things like Onions and more Milkweed. Nothing bothered them until the yard got invaded by Monarch Caterpillars. You guessed it, Momma Monarch finally found the plants. All except the one on the Mango pot. 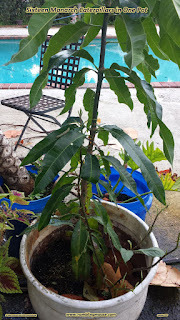 The leaves are similar to the Mango leaves, and I had that one plant growing against the Mango tree's trunk as a support. One by one, the eggs hatched. One by one, the Milkweed plants got stripped bare of their leaves. One by one, the Monarch Caterpillars got larger. Then they ran out of food. This one plant was the only one left. This sole pot had sixteen monarch caterpillars in it. For something that was endangered, I was shocked to see this concentration of caterpillars in one spot. Then the next day it was only one or two. They started to move on. That same evening I found one caterpillar on our windchimes hanging out on the shed. The next day I found myself presented with a little jewel. 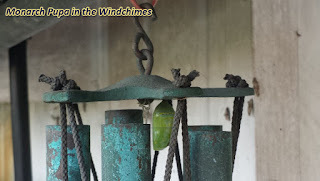 A jade teardrop where that caterpillar had stopped by in that improbable place. It chose that spot to pupate. Monarch Butterfly Pupas are a beautiful thing in the light. They are a translucent jade green. There are two shimmering iridescent gold spots and a line of iridescent gold specks on the outside. 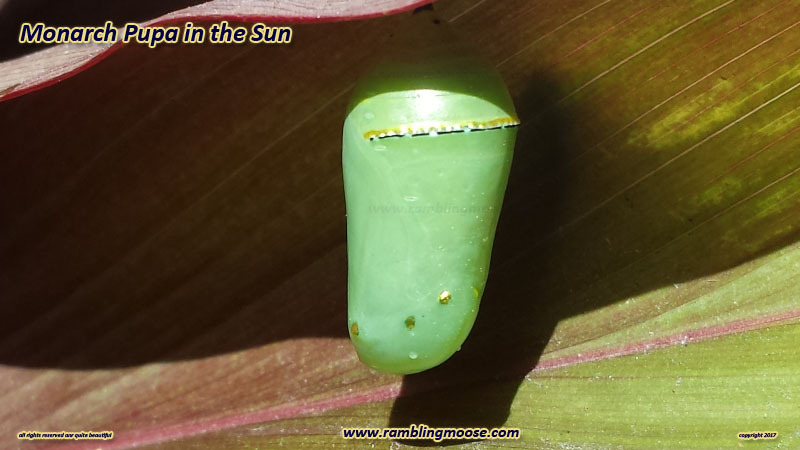 If you are in full sunlight you may be able to make out the internal form of the just pupated creature, there are structures inside that your mind translates into future wings. Later when the creature is to take flight in Orange and Black, the pupa becomes clear, and cracks open. 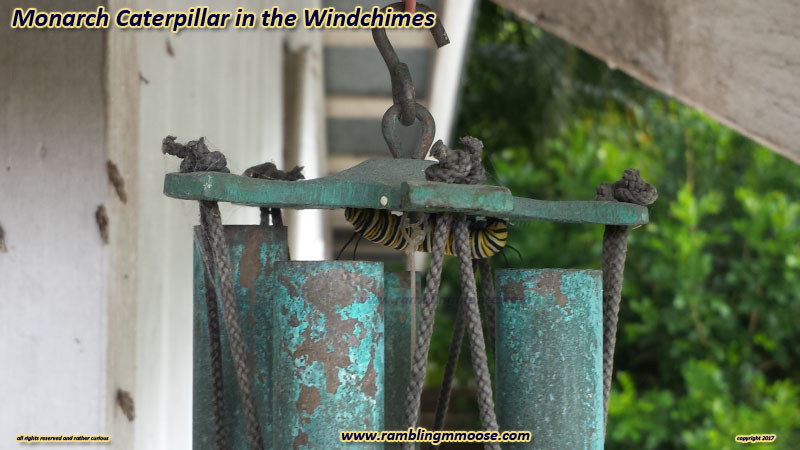 It will expand its wings and fly off perhaps to find more milkweed flowers, if its cousins have not stripped it all bare in the yard. For now, I'm presented with the little jade jewels. Shimmering in the strong Florida Sun.